Very much a ballad, “You Say You Love Me” is one of those tunes that just seem to float along. Although not strictly a doo-wop song, the listener can hear elements of doo-wop, especially with the vocals of the backup singers. While I love the tune, I never have an opportunity to play it out because it is just too mellow for most of the venues I play at, which is why I feature it here for your own perusal.only single she records for Tuba, just one of the manyDetroitrecord labels at the time; and like many of the local labels, Tuba managed to survive for just a short time, releasing about a dozen 45s in its lifespan. 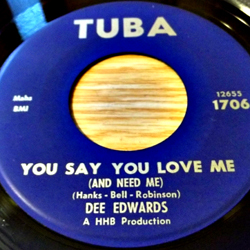 Dee Edwards would record for severalDetroitlabel throughout the 60s and into the early 70s. Her lastDetroitsingle on the De-To label, “I Can Deal With That,” was recorded in 1975. Production tailed off from the mid 70s as she leftDetroitforNew York Cityto focus on her family. Several of her 45s from herDetroityears catch a fair price when auctioned and always seem to generate interest from bidders. I also remember finding “You Say You Love Me” on a private seller’s site asking a C note for a mint copy, but you can usually find a used 45 for much less…. For those interested in listening more to Dee Edwards, you can also go to YouTube and do a search on “Dee Edwards.” You will then be presented with a plethora of possibilities. My personal preference for this type of search is to try to find the icon for the specific 45 I am looking for. Chances are strong that I will be able to hear, and maybe even see, the actual 45 being played! This feature is important especially if I am using YouTube as a cross-referencing tool. For instance, I locate a potentially interesting 45 on-line, but I have no way to listen to it and the track is unfamiliar to me. I would then search on YouTube. You would be surprised how often this works! Enjoy the song! Sound file is for educational purposes only.